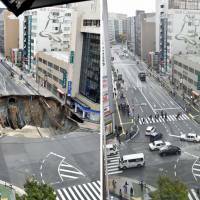 FUKUOKA - A street in the city of Fukuoka reopened Tuesday only a week after a huge sinkhole opened up, disrupting traffic and utilities and threatening to engulf nearby buildings. The fast recovery work was credited to the use of special expertise and soil. The hole, which measured 30 meters long, 27 meters wide and 15 meters deep, developed near JR Hakata Station in central Fukuoka around 5 a.m. Nov. 8. It is believed to have been caused by construction work on a subway line extension. The sinkhole cut off utilities to around 800 households, but no injuries were reported. Fukuoka Mayor Soichiro Takashima said the municipal government was working with the joint venture contracted to build the subway line to compensate local businesses for damages. “I apologize for having caused trouble to many people,” Takashima told reporters after the street reopened to traffic and pedestrians early Tuesday. As the road reopened, authorities lifted an evacuation advisory for three buildings near the site, while Saibu Gas Co. was to fully restart the gas supply to buildings in the area. The municipal government said it will check the road for cracks by sending officials to the site every few hours for at least the next month. The quick rebuild surprised many people in the area. “I thought it would take at least a month,” a taxi driver said. Following a meeting Monday of ground soil experts, a road roller was used to check the ground’s strength, allowing experts to declare there were no safety problems. Repair work on a damaged sewer pipe, utility lines and NTT Corp.’s telecommunications lines has all been completed. Takashima said Monday the ground was now 30 times stronger than before. He said the municipal government wants the Land, Infrastructure, Transport and Tourism Ministry to set up a third-party panel to investigate the cause of the sinkhole. A company in charge of the subway work said an estimated 6,200 cubic meters of soil had fallen into the sinkhole, modifying its earlier announcement of around 7,000 cubic meters. The recovery work was fast-tracked with the help of a special soil that solidifies easily, along with the use of experts with knowledge of mining accidents. Kankyoushisetsu Resonant Inc., which produces the soil, said it received a call for help a few hours after the sinkhole emerged. Blended with water and cement, the soil becomes hard even in water. It had been provided when cave-ins occurred at old coal mines in the prefecture. “At old coal mining sites, water often fills in hollow spaces. 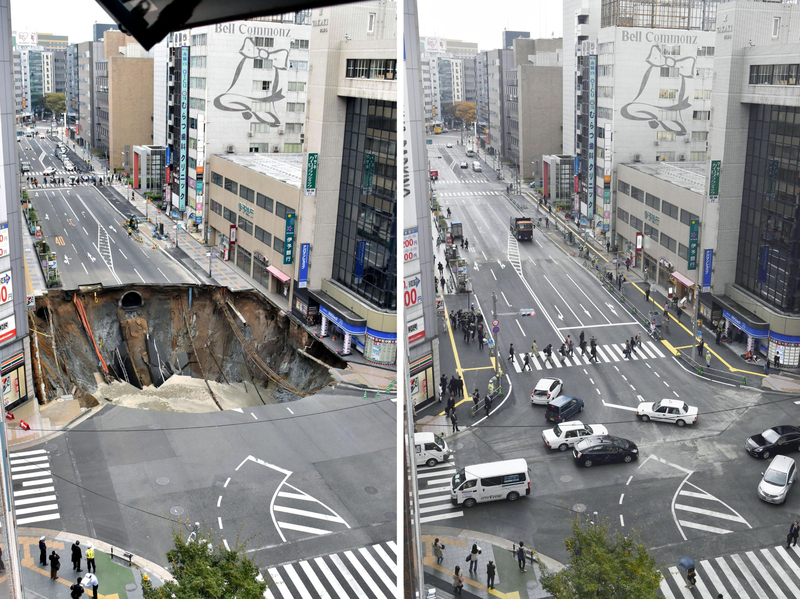 This sinkhole looked quite similar,” said Kenichi Ikubo, Kankyoushisetsu Resonant’s sales division manager. By the evening of Nov. 9, the soil was used to fill the hole to a depth of around 3 meters, offering a platform for workers to repair sewage pipes and utility lines.